Dev Singh was born in Chandigarh, northern India. His early childhood was strongly influenced by various classical Indian music gurus and at the age of twelve, he started his musicology studies. He has followed the ancient tradition of Guru-Shishya system (an intimate master-student relationship), in which the Guru passes knowledge through the spiritual, intellectual and emotional bond between them. This early education included the history of Indian classical music and understanding the complex rhythmic and melodic structures (called Ragas). 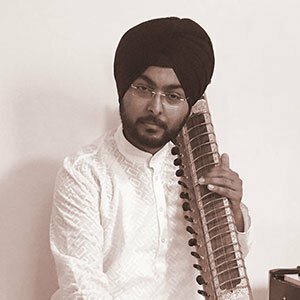 Across his learning years, Dev Singh’s teachers (Gurus) introduced him to spiritual and healing aspects of Indian classical music, which included music (Nada, Mantras) and meditative (Dhyana) Yoga. We are blessed to have Yogi Dev join us at The Sound Temple to share his gifts of Nada Yoga as part of our team who currently host Vedic Chant, Kirtan, Yoga Nidra, Nada Yoga, Indulgence Retreats, Satsang and special events.